12T Vanfit B 774874 at the Nene Valleys Wansford station in 2007. 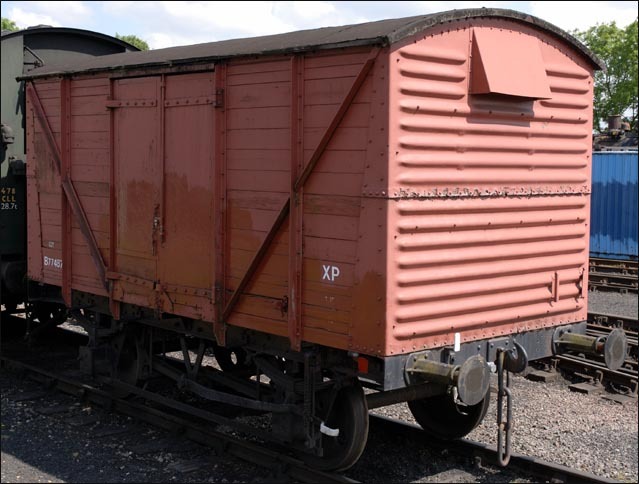 This is one of 20 vanfits that came from the British Sugar Factory at Spalding in 1992 and came to the Nene Valley Railway. This was British Railways standard covered van. This one was built at Wolverton in 1957 to lot 2991 Diagram 1/208. 19063. This Diagram were built, in 22 lots. It is a number of years since all or most of these Vanfits have run together in one train at the NVR. Lets hope they will some day all will run in one train again. This was BRs main covered van. I have 19 more to add to the list below!